Michelle was the photographer who actually came to our home to do our newborn photos after our baby girl Penelope was born. 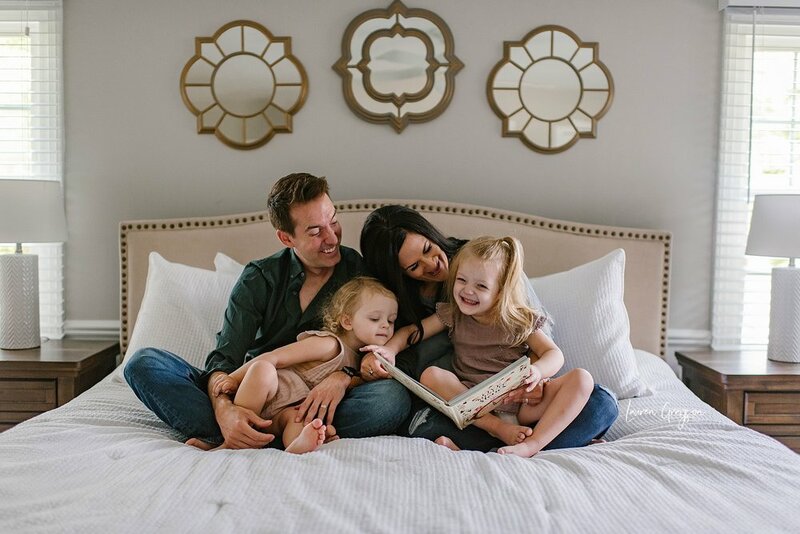 I was so excited to get to meet her girls and work with her and her husband on capturing some moments at home once I returned from maternity leave. Her girls are the sweetest, and their home was perfection! Michelle’s style is right up my alley, and she was excited to have some photos in their home because they had just recently moved and were making this new house into a cozy home for their girls. Since they hadn’t been their long they didn’t have many photos in it and what better time than the present to change that! While I have a serious love for outdoor family sessions (I just love the warmer months and being outdoors!) there are some great things about in home sessions as well. 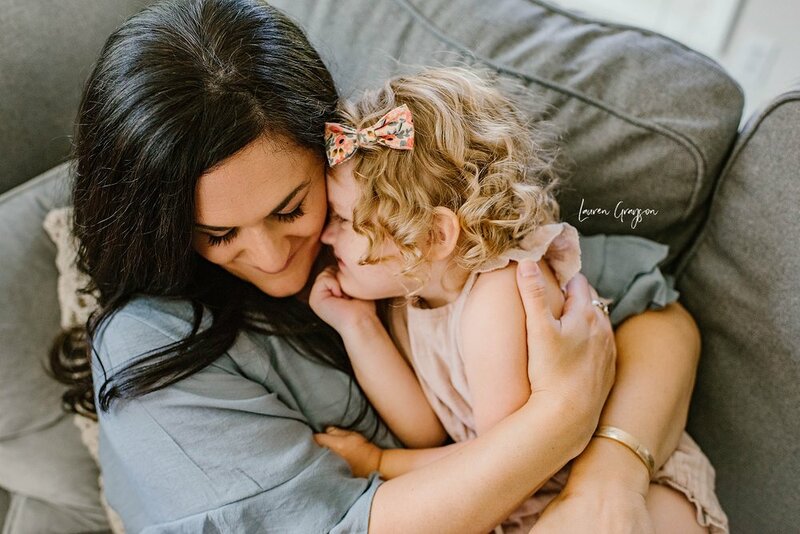 I am going to share with you just a few of my favorites from their session, as well as 5 reasons an in home session might be for you! Kids are Comfortable - Where do your children feel most ‘at home’? Well, home. Obviously! If you have the type of kids who become extremely shy when taken out of their element or go a little wild, you might find they are most ‘themselves’ when at home. Which makes perfect sense for very obvious reasons, right?! Home is where every child will be most at ease and relaxed. They have all of their things and belongings (many of which they usually can’t wait to show me!) and they aren’t in a strange small space being placed in front of a backdrop and forced to sit still in a small area where bright lights shine on them. If you have little ones who are overwhelmed and upset by studio scenarios, an at home session is a great alternative to traditional studio milestone portraits! Creating a Time Capsule - Recently, my husband took out some old photos from his childhood to show me what his Grandmother’s home looked like. He joked that even though he grew up in the 80’s, he felt like he grew up more in the 50’s because of the way his family had their homes decorated. He tried explaining to me the artwork on the walls and lamps and other things that filled his memories, and I honestly didn’t have a clue as to what he was talking about. I wasn’t familiar with any of these things and couldn’t envision them, and grew up in the 80’s with a family who decorated accordingly to the time. While no, his family hadn’t had professional photographers come to their homes to document their daily lives, he was able to find enough photos that had things in the background he could show me to explain what he meant. And I think you get my point here. Having an in home session is creating a time capsule of sorts for both your future selves and your children, and their children and so on. That old couch your children will remember cuddling up on with you to watch movies, the chair you rocked them in when they were sick and weren’t feeling well. The pillows they felt they just sank right into, the decor and details of their childhood home. Photographs are one of the best ways we have to remember things. Ever looked at a photograph and you could almost be reminded of the way something smelled? Maybe a vacation photo from the beach, brings you right back to the sounds and sights of that tropical trip. Warm sun, salty sea and smell. Photographs are an amazing way to go back in time and remember. The Most Unique Photos You’ll Ever Take - Again, don’t get me wrong, I do love outdoor photos. But in home sessions allow a kind of unique opportunity that no outdoor session can. Your home is a sacred space that no one else has. It’s an original location that all your local friends and family won’t be able to also have their family photos taken in (unless you start charging to rent out your space!) and that makes it so special. In home sessions give you the chance to do fun activities together while having your photos taken or capture your everyday routine and life that you don’t want to forget. Whether it’s the run of the mill day or special things like making cookies or playing games and running around the backyard or reading together on a window seat, your home is a really special backdrop for memories. Genuine Moments - Since kids are the most comfortable at home and in their own environment (as we discussed above!) those genuine smiles and giggles are likely to be a lot easier to get during an in home session. Getting to be able to see your family in a new light with an outsiders perspective can be a really unique opportunity during an in home session. My job is to capture you and your family just as you are, accurately, beautifully and artistically. If genuine and authentic moments are what you crave for photographs, an in home session is a wonderful way to get this. BONUS REASON! - I know, I said there would be 5 things but I am adding in a 6th one because it NEEDS to be said! One of the most amazing things about an in home session is that there is NO rescheduling due to inclement weather! No back up rain dates, canceling at the last minute and dealing with all of that for you! Also, these can be done YEAR round, anytime and we don’t have to work around sun or weather NEARLY as much as we do for outdoor sessions. You can’t get much easier than that! 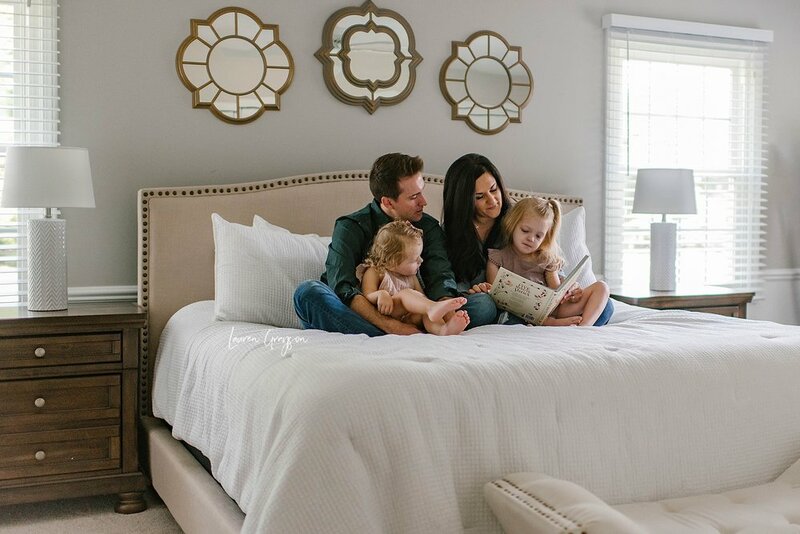 Now that you’ve read a little more about why I love in home family sessions so much, please enjoy some of the images we captured during the Jone’s families session with me! If you are interested in more information about scheduling your own session, let’s chat!